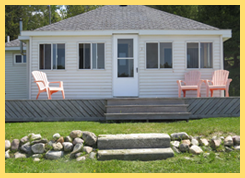 With a number of different cottage options and numerous activities to keep you entertained, there's nowhere better to stay than at Fort Drummond Marine & Resort. Take a rental boat out on the lake and have a fun day in the sun, visit a gift shop with a wide range of unique items, or observe the beauty of nature all around you with the region's natural flora and fauna. Get the vacation you need when you stay in one of cozy cabins and cottages. Fort Drummond Marine & Resort on Drummond Island, Michigan, has been helping people get away from it all for more than 45 years. Family-owned-and-operated, we provide a number of services that fit the needs of vacation-goers and boat owners alike. We are dedicated to customer satisfaction and love to see our guests having a good time during their stay with us. We know what it takes to make our guests feel welcome from the moment you drive onto our property. Our staff goes the extra mile for everyone who stays with us to ensure they're having an enjoyable experience. Our gorgeous location and array of amenities lets you relax surrounded by nature while actively participating in activities that allow you to completely destress.